Tell us about the making of Nenu Meeku Telusa? We shot the theatrical trailer of the film on 24th and 25th of November 2007. Then we wanted to start the shoot in December 2007, but I requested the producer Lakshmi to delay it by a couple of months. The shooting of the film was started on 15th of February 2008. The first schedule was shot in hero’s house set in Madapur for 15 days. Then we shot the college backdrop in Tirupati for 10 days. Then we went to Airtel Office in Hyderabad to shoot for another 10 days. We shot the entire action sequences in the film for 10 days with Hollywood stunt choreographers chipping in. We shot the six songs of the film in 20 days. The remaining work was shot in 9 days. In total, it took 74 working days to make Nenu Meeku Telusa? The CG (computer graphics) work took three months (done in parallel with the shoot). The editing took around 2 months (parallel). The DI (Digital Intermediate – color grading) took around a month. Now we are ready to release the film on 10 October. 1. Talakona song: When we were shooting the college episode in Tirupati, we scouted for a song location and we found a perfect one in Talakona waterfalls. Since it was in the peak summer, the water was flowing very slowly. Generally, they shoot the actors by keeping them around 40 feet away from the falls. Due to summer, I got an opportunity to make the lead pair stand in the fall. I choreographed the song, as it was unplanned. 2. 1st song in the film: I was roaming around and happened to be there at Aluminum factory. Lots of films were shot in that factory in the past. I wanted to do something different. I and Naveen (editor) worked for Krishna Vamsi’s danger. At that time Naveen cut a variety trailer and Krishna Vamsi stopped it because he thought it would not be liked by B and C center crowds. To cheer up Naveen, I told him that I would make him direct a song in my film when I become a director. I forgot that promise, but Naveen remembered. I made him direct that song. 3. Brahmanandam’s mannerism: One day Brahmanandam casually twitched his eyes and asked me how it is. I found it to be amazingly funny and I asked him to keep it as his mannerism. Brahmanandam admitted to me that he never done a role of fashion designer in any of the films he worked. He is projected as a stud, but not as buffoon in this film. He looks good in this film. I tried to bring comedy by the situation’s strength instead of using Brahmanandam’s expression. And there are not counters to Brahmanandam in this film. 4. Moon light dance: There is window in hero’s house set where we show the sunrise though it. I asked Sunil if he could create moon rays with his lighting and he obliged. Then I felt that a dance in moonlight would be so romantic and I asked Manoj to do some dance (without any music). It is a pretty original scene which you would never have seen on Indian cinema before. It’s been a custom in Telugu films to make a group of dancers dancing behind hero and heroine for no reason. Except for Mabbe Masakesindile, we don’t have any group dancers in other songs. All songs in this film are conceptual. Each song is cut to the mindset of the hero at that point of time (sometimes confused, sometimes aggressive, sometimes drunk etc). Camera, mood and lighting changes according to the mindset of hero. Colors used in entire DI are surreal. 3. Theatrical trailer released even before the commencement of shoot. Santosh and Sakti are protégés of AR Rehman. And they worked for most of AR Rehman’s projects including that of international. We hired a room in Green Park hotel and converted it into a studio. They took 15 days to compose background score. They used to do live recording during the middle of the night. BGM of this film is also like a song. When we took the film to DTS engineer Ravi, he said that the background music is pretty low. Ravi has been in this business for the past 19 years. I asked him to increase the bg music level. In Indian films, they keep the background music low so that dialogue could be made loud. Ravi said that only Gowtam Menon clubs dialogues and music together. I asked him to make the entire film appear like a song. In 3-4 instances, I drowned the dialogue in music (climax scene too). Yugandhar (Founder of Pixelloid) said that he is going to his NMT work as showreel to his company. The engineers at Prasad EFX felt that this is the best DI ever done by them. Cinematography by Sunil is going to standout. His earlier films only projected 1% of talent he possesses. NMT is going to bring of 85% of his expertise. He is going to be one of the best cameramen in the country with NMT. After watching the songs, Krishna Vamsi said that picturization of songs is too advanced. He said that NMT is going to usher the next generation of filmmaking and we are going to lead in the future. Are you tensed about the release? I am cool. I am never a struggler. I came from a well-off family. During my time at O & M advertising, I told Rana (son of D Suresh Babu) that his script is a joke. He invited to direct the film. The next day we scouted the locations. We shot the film on 3rd day for festivals. After that Krishna Vamsi asked me to assist in the script work of Danger followed by Rakhi. Then Manoj offered me NMT film. I will never get tensed. Who do you thank for your opportunity in Telugu film industry? It was RaNa who took me into film industry. It was Krishna Vamsi who gave me the push. And it was Manoj Manchu who gave me the real break. I am getting offers from a few producers in Telugu and Hindi. I am waiting for 10 October to see where I do stand. I am neither desperate nor under-confident about my next project. 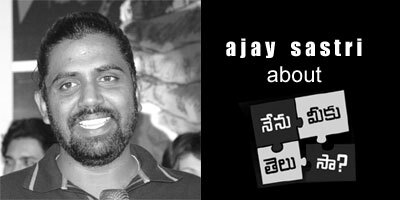 click here for the interview of Ajay Sastri taken before the shooting of the film.